Personyze’s onsite behavioral targeting solutions allow you to quickly and easily deliver targeted messages, promotions, and content to your visitors based on a variety of real-time and past behaviors, along with many other tracked variables, for a highly targeted experience that drives high conversion and engagement. Deliver targeted messages, promotions and content based on 70+ user attributes, including site behavior, demographics, location, CRM data, referral, weather, social data, and more. Target personalized content, site messages, and emails, based on multiple data sources like site behavior, demographics, location, CRM data, referral, weather, social profile, cart data transactions, and more. Use smart behavioral triggers such as trigger on exit intent, on idle, on timer, on products added to cart, on cart error, and more. 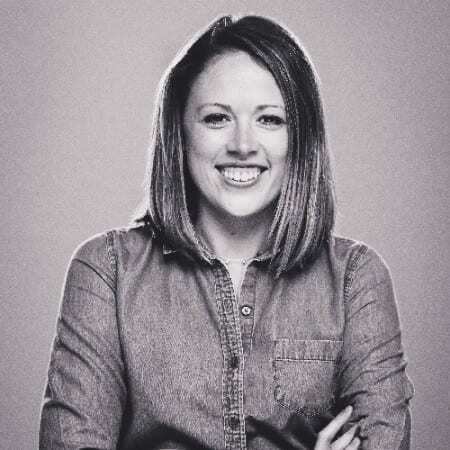 Trigger campaigns when the visitor is most likely to engage, or most at risk of bouncing. Synchronized your data automatically, or upload your user email lists, CRM data, and product catalog. Connect your CRM solution using easy integration, webhooks, and our robust API. Powerful Targeting Based on 70+ User Attributes. 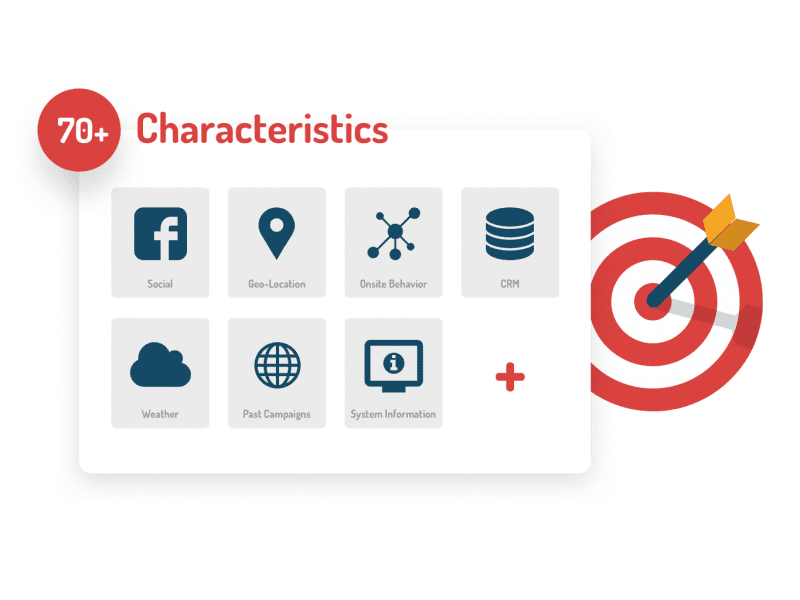 Start targeting based on 70+ user attributes, including visitors’ real-time and past behavior, demographics, geo-location, CRM data, referral, weather, social data, session dynamic data such as cart value, internal search, form input, custom KPIs, and more. Enhance targeting by integrating your available data from other sources, using API or user feed synchronization, to target based on any data you have in your database. Personyze is able to “grab” or scrape data from any tracked page element on the site, such as a search bar, login field, or current cart value, and show specific targeted content based on this data. Targeted content can also be shown based on the source of the visitor’s referral, such as Google, LinkedIn, or Facebook ad campaigns, or referring websites. Personyze knows the visitor’s current weather forecast from their location data, and so you can target based on various aspects of weather, like temperature, air pressure, or precipitation. Show targeted content based on the visitors most visited pages, as well as their ranked interests from product/content interactions. Our system knows the visitor’s location based on IP intelligence, and therefore also knows the current weather forecast for that location in detail. You can include or exclude visitors from various cities, regions, and countries in your campaigns, as well as based on aspects of their weather such as temperature and precipitation. Personyze is able to reference a registry of IP addresses which are associated with various companies, allowing you to show specific messages to visitors browsing from computers/networks associated with specific companies. By uploading or synchronizing your CRM data, you can utilize any custom data point you can imagine for targeting, including industry, company name, position in funnel, account type, etc. You can show specific content to visitors with certain system characteristics, such as desktop vs mobile, browser type, or browser language. You can utilize various behaviors on the site to identify a visitor’s interests and target them with personalized content, including most popular page, whether or not they visited a list of pages, or the time that they entered the site, among many more. Create behavioral targeting campaigns combining a sequence of onsite targeted messages which change based on campaign interactions, followed by an email drip campaign for those who showed interest. Use real-time alerts and get notified when a VIP customer engages your campaign so you can jump on the opportunity. You can also edit your current banners or popups using our What You See Is What You Get (WYSIWYG) visual editor to change any element of a page. Personyze can embed banners or forms directly into your web pages, using a visual point-and-click interface to select the location on the page where you want to insert it. Set Popups to trigger based on a timer, which begins when the visitor enters the page. Set your message to appear as a top or bottom bar, which pushes the rest of the site content either up or down. This can be great for reminders, coupon offers, and many other implementations. If you have HTML or JS content you already have and want to implement using Personyze targeting system, a special tool is included which allows you to do exactly that. Create a sense of urgency by showing visitors a countdown for a special offer, which can be set based on the date or the time which they acquired the cookie. Personyze’s product and content recommendations are generated for each individual user based on a variety of factors including their personal interactions with your site, crowd data, behaviors of those with similar demographics, and machine learning algorithms. Utilize a real-time campaign performance dashboard, and conduct A/B testing on the fly. Set triggers for performance alerts to your team to maximize your campaigns’ effectiveness. 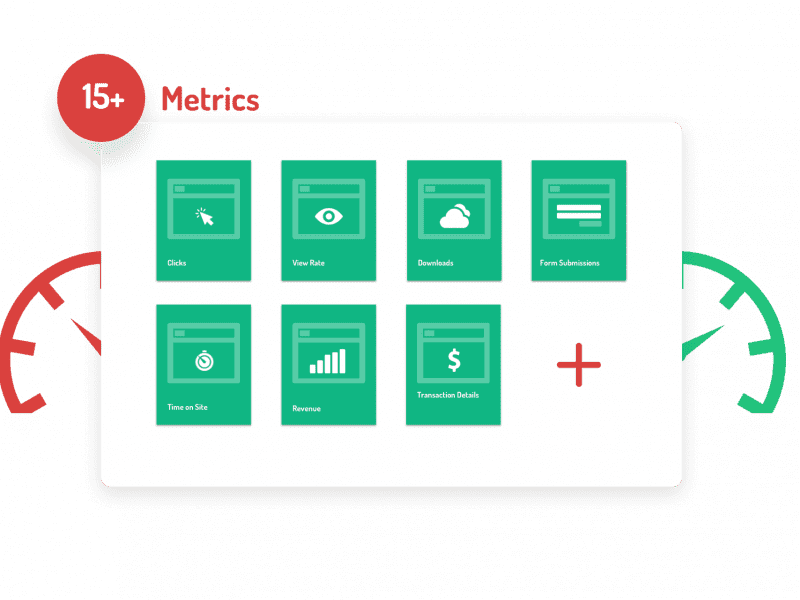 Get a comprehensive campaign performance view, with metrics such as impressions, click through rate, bounce rate, conversion rate, campaign revenue, unlimited custom metrics, and many more. Drill down to see performance in detail filtered by dimension, such as referrers, geolocation, etc. By default, Personyze reports campaign performance in real-time to Google Analytics. The moment you publish a campaign live on your site, data on it’s performance is sent to Google Analytics, by default. Find the exact content, layout, and behavior that get the most engagement and conversion, and pick the winner manually or have it automatically deployed. Rotate out different content for each navigation of page refresh, to maximize exposure of various messages and offers. If overlapping campaigns conflict, you can assign them weight, so that the most important will be given priority. With our cross-device tracking, you can target the same user on multiple devices so that the session count and other logic and data for the visitor is uniform across their browsing via different devices. Limit your content to stop showing after a visitor has seen or clicked on them, for X number of sessions, to avoid annoying visitors. You can set a campaign to automatically deactivate if the number of views or clicks are over or under a given amount. Easy to Use, Integrates Into Your Site in Minutes. Our step-by-step wizards guide you through the process of creating site behavioral targeting campaigns, and industry best practice responsive templates make the process even easier. If your website loads in a browser, then Personyze can personalize it in every detail. There is no limitation due to website platform, including all ecommerce and content formats. Personyze is an extremely versatile solution. Personyze templates are professionally created according to industry best practice standards, and are fully responsive on all devices, by default. Every custom field you create (user industry, account type, etc.) becomes a personalization tag that can be inserted into your campaign creative, for a more personalized experience. Personyze has a visual simulator interface for you to set up tracking of cart value, adding to cart, checkout, search box inputs, and more. Track virtually anything that appears during a visitor session, without writing a single line of code. The simulator allows you to impersonate other types of users, by selecting location, CRM data variables, and more, so that you can see how the campaign will perform for different types of visitors. With Personyze, our teams around the globe can now deliver new targeted promotions and messages within hours instead of weeks. Moreover, our local marketing teams around the world are empowered to manage their own marketing campaigns without the involvement of our core development team! We use Personzye for clients from the financial industry to deliver a personalized experience with content and calls to action which are aligned with visitors’ interest and location. The managed service team was very helpful in the implementation with some of our more complex use cases. If you can verbally describe the visitor’s targeted behaviors, Personyze behavioral targeting engine can deliver them targeted ads, personalized content, quality recommendations, and everything you need to wow them along your funnel into conversion. 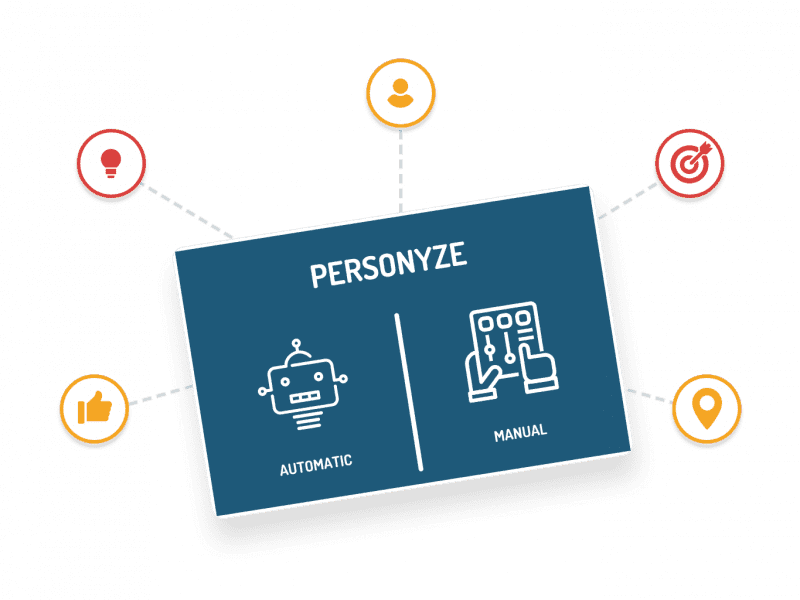 Personyze is a comprehensive suite of personalization and marketing tools that gives you the power of AI and Big Data. Create a personal and engaging digital experience at every touch point that drives higher engagement, conversion, & accelerates your marketing effectiveness. Copyright 2009-2018 © Personyze. All Rights Reserved. We’ve been doing personalization for over 10 years, you could say we’ve learned a thing or two. Schedule a free consultation to brainstorm with us on your strategy.